Yesterday was the Anihan Arts and Academic Showcase at the University of Toronto. There I spoke about our responsibility as Filipino-Canadians to be active in the fight of all Filipinos for respect, cultural pride, and national sovereignty. This weekend (starting 15 October) is the beginning of the Toronto portion of the global “Occupy” movement. I will be there to stand with my kababayans, and with all that realize that we need to create a more just world. Yes I am Canadian. Yes I am Filipino. And this means that I, and we, bear responsibility for both sides of our identity. This dual identity also helps us cultivate a global identity, we must see that the issues we have as Filipino-Canadians are intrinsically lined to the motherland, and that the issues of the motherland are tied to the policies of Canada, the US, and the world at large. Do either you or your family send money home to the Philippines? Do you have a relative or friend that was/is a temporary worker in Canada? Do you pay taxes/pay into the Canadian Pension Plan? Do you own anything containing gold? You probably said yes to most of those questions and you may already see where I’m going with this. I just personally sent my first remittance to the Philippines just recently. Family there just had to close their very small streetstall business because of the growing poverty in the country driving down sales and driving up desperation. The reality from the streets was that the police payouts increased (they’re working class and getting screwed too) and it made their very modest income dip into the red. Filipinos worldwide sent back $21.3 billion in remittances in 2010, which made up over 10% of the Philippines GDP—basically making the export of people the countries greatest economic resource. Approximately, 4000 people leave daily to become overseas foreign workers, and that’s a disturbing number. This breaks up families and destroys hope in the nation to support itself and care for its citizens. And despite all this money, the Philippine economy continues to sink rapidly. On the other hand gold and the paying of Canadian taxes also directly link to the deteriorating situation in the mother country and to the *extremely relative* current economic salvation of Canada. Canada is one of the top mining nations internationally with approx 75% of the world’s mining and exploration companies traded out of the TSX. And the Philippines has the second largest gold deposits internationally for it’s land mass. In 2009 alone the extractive industries (like mining) generated 11% (or $133 billion) of Canada’s GDP. Canadian taxes go to fund these same companies through economic incentives for the multinationals and to false ‘development’ plans. Open pit mining in the Philippines also benefits Canada because it brings with it the displacement of people, environmental destruction, and human rights issues. All this means people need to find a new livelihood, and they get angry with the country and want out, so it’s in the towns near these mining communities you see the “Find Work In Canada” adverts. It’s there that you find the agencies that supply OFWs often at exorbitant cost. Currently 30% of the country (66% of the Cordillera) is covered by mining applications. Philippine hardship is linked to Canada, and Canada’s *relative* economic success is linked to the Philippines. It’s a win-lose situation. And we, as Fil-Cans, must recognize that and do what we can to correct. I’m happy to see a growing interest in “Filipino-ness” these days. I know how important cultural identity is, but I feel that identity issues alone aren’t enough to uplift us: as members of Canadian society we still need to look back to the homeland. Along with advocating for better conditions here in Canada we need to advocate for a better Philippines, because only a truly free, truly democratic Philippines will result in the uplift of all of us. It wont be until we stand as our own masters back home, that we, each of us, will be respected everywhere. This weekend is the Occupy Toronto gathering of the majority, the “99%,” where we can stand in solidarity with each others issues. Where we can all recognize that something is wrong, and that together, we can fix it. 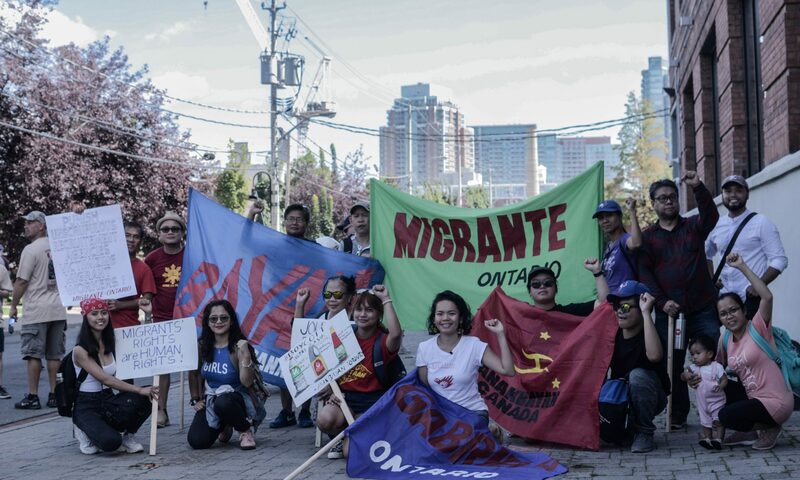 ANAKBAYAN Toronto is one of the overseas chapters of ANAKBAYAN, the comprehensive mass organization bringing together Filipino youth from all walks of life for the cause of national freedom and genuine democracy in the Philippines.